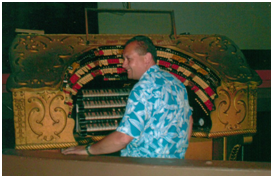 A founding Egyptian Theatre Preservation Association board member and its first President, David’s love of the Mighty Wurlitzer pipe organ and historic theatres began in the 1970’s, when he first heard a Mighty Wurlitzer at the Old Town Music Hall in El Segundo, CA. A lengthy career in theaters in California followed, before David and his wife Lupita moved to Coos Bay in 1990. Here he discovered the treasured Egyptian Theatre and its own Mighty Wurlitzer. In 2005, when he heard the news that the future of the Egyptian was uncertain, he joined with others to form the ETPA and has worked tirelessly since to support the restoration of the theatre. Many accomplishments were made during his tenure as the ETPA’s first president and in the years since. A large banister was removed that was built in front of the orchestra pit that obstructed the view of the Mighty Wurlitzer. David built a console for the organ, raising it more than 2 feet. He was also the driving force behind removing the mini theaters that were constructed in the balcony and restoring the balcony. He also worked tirelessly in readying the Egyptian for re-opening after structural repairs and enhancements were complete. His background skills and willingness to serve have been pivotal in saving and restoring the Egyptian. David’s devotion, length and quality of service to the Egyptian have earned him the Golden Charioteer designation.